We’ll be at TrusTech 2018 in Cannes from the 27-29 November on Booth #RIV J054. TrusTech encompasses all the secure technologies and applications that are being developed and deployed including new, emerging & disruptive trends. This covers digital identity and credentials, new payment mechanisms, biometrics and the greater adoption of AI, which is increasingly being employed in automated threat detection, big data and analytics and areas from cybersecurity, to banking and financial services, to retail, to enterprise and smart home. 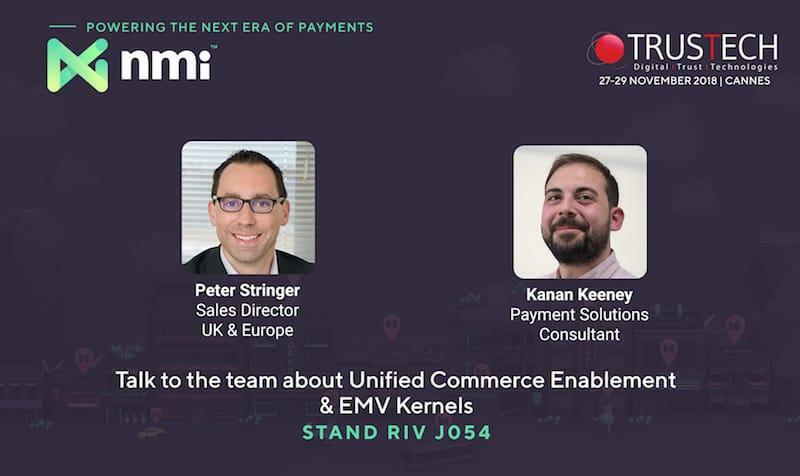 If you’re interested in omni-channel payments and EMV Kernels, we’d love to chat to you. We offer a number of SDKs which connect your point of sale (POS), mobile POS (mPOS) or e-commerce solution to all the major processing banks that our omni-channel EMV ready payment gateway is integrated with. We have already pre-certified the most popular PIN pads with some of the largest processors to help you speed up your integration process. Attending the show from NMI will be our Sales Director Peter Stringer (peter.stringer@nmi.com) and Payments Solution Consultant Kanan Keeney (kanan.keeney@nmi.com). Please feel free to contact either of them directly or alternatively please email hello@nmi.com for further assistance.